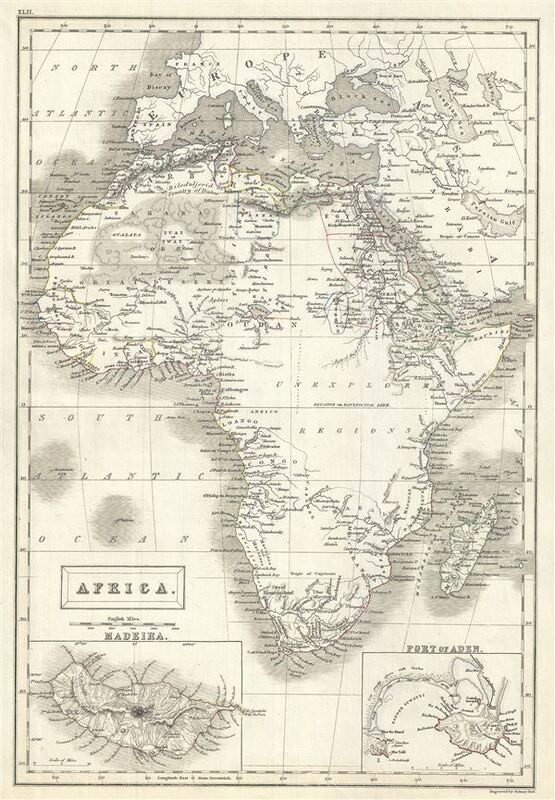 This is a lovely example of the Adam and Charles Black's 1844 map of Africa. It covers the entire continent from the Mediterranean Sea to the Indian Ocean and the South Atlantic, including the island of Madagascar. An inset map in the lower left quadrant details Madeira while another inset in the lower right quadrant details the Yemeni Port of Aden. Various towns, cities, deserts, oases, mountain ranges, rivers and several other topographical details are noted with relief shown by hachure. A large portion of central Africa remains unexplored though the Sahara or Great Desert is beautifully rendered. The present map exhibits various speculations regarding the unexplored interior of Africa. The course of the White Nile shown here is speculative at best, while Lake Malawi (Maravi) appears in its embryonic form. The cartographer correctly identifies Lake Chad, while a region in modern day Algeria is marked 'Bileduljerid or the Country of Dates.' Several indigenous African tribal kingdoms are identified along the coasts. The Mediterranean regions of Fez, Algeria, Tunisia and Tripoli and the ancient Greek and later Roman, Byzantine colony of Barca are noted. The map also identifies the inland oasis Kingdom of Fezzan. Though mostly desert, 19th century Fezzan had numerous oases and supported a relatively large population. This desert kingdom was a critical stopping point for trade caravans crossing the Sahara since antiquity. At the time this map was made, the slave trade, thriving since the 5th century was rapidly diminishing due to decreased demand for slaves in the New World, the British outlawing of slavery in 1808, and subsequent diplomatic efforts including treaties with over 50 African rulers outlawing the practice. Many African economies adapted by shifting to the export of mineral and agricultural resources, which led to the European scramble for territory, occupying most of the continent by the end of the 19th century. Europe's colonial interests in Africa haphazardly carved up the continent into unnatural territories, often forcing historic enemies into close proximity and leading to social problems that remain to this day. This map was engraved by Sidney Hall and issued as plate no. XLII in the 1844 edition of Black's General Atlas. Rumsey 2305.048 (1854 edition). Philips (atlases) 4334.